After this, the only Arnold Schwarzenegger product I will ever again patronize is a never-to-be-made movie called, “The Pardonator,” about how Kennedy-by-osmosis-and-sexual-relations, Schwarzenegger, pardoned the murderer son of his liberal Democrat political crony in the California Legislature. Thanks to our friend, XM and syndicated national radio host Brett Winterble, for tipping me off to this outrageous video of the ex-Governor mocking reporters who are asking “why the pardon” on behalf of the father of the murdered victim. (We discussed it in a pre-tape for his radio show tomorrow night, on which my interview will appear.) It’s simply disgusting. You must watch the whole video. Why Republicans–conservatives!–ever supported this piece of ap-cray, I’ll never know. I wasn’t among them because I knew he was a liberal, and I don’t believe in promoting celebrities for office. Amazing that this schmuck cares more about phony global warming than the grieving parents who lost their son to wanton murder by Schwarzenegger’s friend’s son. Former Governor Arnold Schwarzenegger made snoring sounds when reporter Dave Bryan questioned him about reducing the prison sentence for Estaban Nunez, son of former Assembly Speaker Fabian Nunez. After receiving an award for championing environmental causes at a global climate change conference in Hollywood on Thursday, former Governor Arnold Schwarzenegger slipped out the back door, where Dave Bryan was there to greet him. “Don’t ask me the same question ok because otherwise you’re boring the hell out of me…” Schwarzenegger said. “Well, I think a lot of people want to know. Why did you reduce the sentence for Estaban Nunez?” Bryan probed. To that, the former Governor made snoring sounds, emphasizing that he was bored with the question. What’s boring the former governor are questions about why, in the closing hours of his governorship, he cut the prison sentence for Estaban Nunez, son of former Assembly Speaker Fabian Nunez, by more than half — from 16 to 7 years, in a case involving the killing of 22-year-old college student Luis dos Santos in San Diego. Nunez didn’t dispute the facts, didn’t contend he was innocent, and didn’t stand trial, choosing instead to plead guilty to manslaughter and assault charges. Santos’ father has no answers and is rightfully upset over this outrage. Arnold Schwarzenegger might have played a tough guy in the movies. But in real life, he’s a liberal, soft-on-crime, cronyist scumbag. Schwarzenegger is pitching a reality show, but the only reality he should face after this is total ostracism. To say he’s a jerk is the understatement of the year. He deserves his justly earned ignominy. He was a huge failure as California Governor and no one misses him. There’s a reason why celebrities don’t make good politicians. Few of them have smarts and principle. Hasta la vista, baby indeed. What do you expect? His father was a Nazi official, who, I am sure, killed lots of Jews, so you see, Governor Achtung learned to embrace murderers at an early age. Perhaps early release of Nunez will facilitate retaliation for the death of Santos. Hard to seek vengeance while he was incarcerated? When the government fails at protecting the public, it encourages anarchy. Schwarzenegger is, after all, a Kennedy. ‘Nuff said. Worst Governor in CA history. This is really a despicable act and much more so than Clinton’s pardons of Mark Rich as well as the Puerto Rico terrorists. Are there any real heroes in Hollywood or are all actors just well-costumed pieces of dreck? BTW…morals are not the only thing “crumbling” in America. Please watch HISTORY CHANNEL, 10 PM Sunday night, for INSPECTOR AMERICA series. Are we in free-fall deterioration of our infrastructure? Soon, we will be Zimbabwe or Haiti and all these actors and politicians will have a vast audience of corrupted citizens to play to “at home”. What will Arnold’s PENSION AMOUNT be and will he get a Bonus for stupidity? Arnie is as much a conservative as Brit Prime minister Cameron. That is, not at all. These and others have completely perverted the English language. I guess that means Bruce Willis is the next governor of California. I’ll support him. I will admit I voted for him the first time (I know, I know). However when he failed to include Tom Mclintock on his advisory team, I knew he was all talk but nothing of substance. I just glad he is gone and hopefully gone for good. When I first heard him reducing the sentence of this scumbag, I lost what little respect I had for him. Time to look for a new term that’s is free of “-isms”. Who’s with me? We don’t need no stinkin’ ‘new’ terms- we just need to use the dictionary definitions of existing words. ‘Conservative’ or ‘liberal’ should NOT mean: someone who lies about the need to invade other countries when the actual reason is to make their friends richer. He and his wife might as well as have been enemy agents. They destroyed a State. Arnold long ago demonstrated what he actually was. He is an aging weightlifter who impersonated an actor, and later pretended to be a governor. I would love to see him sent back to Austria, since he retains dual citizenship. Arnold did not even think enough of his adopted country to cut his ties to the old one. America is a place to get wealthy and attain celebrity status in, but that is it for him. Mr. Schwarzenegger is a souless creature with no value system above and beyond a very narrow sense of self-interest. All of this was on display in California during his first term as governor, and yet he won reelection in 2006. California got what it deserved, and is continuing down that path with a retread named Jerry Brown. 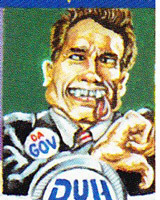 Ahnold managed to undo what Gov Grey-out Davis did – hand the state over to the GOP. And govern in such a way that the Dems got it all back. Had he tried answering the question asked, the answer would have been true lies. Wait until Obama pardons Mumia Abu-Jamal. See how much “snoring” there is then. Arnold’s press agent and Fabio Nunez( Estobans father) are business partners.Arnold cannot defend lowering the sentence of the punk so he makes snoring sounds. The other possibility is after his long term steriod use, along with his testicles shrinking, his brain may be more damaged than we know. He is SCUM!! Is there anyone left, in public office, for us & our children to respect? Look up Lt. Col. Alan West -a man of honor and a patriot. Debbie I can’t see these videos as my iPhone doesn’t support flash and probably never will. I hate to be pushy but considering I invariably make the best comments could u please switch to a different video format? The smartest, most creative and in my case the best looking people tend to have iPhones and we are all using them to web surf and miss seeing these flash items. YouTube I can see. Hes been a disaster since he’s gotten into office. Well look what happened the last time an Austrian tried to play in the Big Leagues. Utter disaster. Never again. AAS (true, those are his initials) over testosteroned, shrivelled testicled, bird brain with the IQ of a plank, has decided that he WANTS to be considered for the position of President of the European Union. Suffering from extreme delusions of puffery, he should be stuck away before he does anymore damage. We know he has an Austrian birth certificate but a medical test scanning the space between his ears should also be a requirement in future employment in a European post. Honesty, integrity and trust are no longer valued, how shameful. Another Kennedy driven project, with a dismal record of under achievement.